« Who is your Social Media lightening rod? Tim Kassouf the Director of Marketing at G.1440 wanted to get in front of me to tell me about his interactive firm. As an experiment he had tried targeting his girlfriend (now fiance!) with a Facebook ad just for her and it worked. Now he turned this idea on his B2B prospect list (which included me) and with a few clicks he was able to target me precisely. By choosing 5 publicly available attributes: US, Male, Married, Avaya and Grateful Dead (ok maybe I saw a few Grateful Dead shows) he was able to send an ad to an audience of “approximately less than 20”. His rationale – “if I don’t hit Paul I will get someone in his organization that will know him and forward it to him.” But he didn’t have to – he targeted me perfectly with an ad as unique as my fingerprint. So how much did this targeted advertising cost you say $100, $200, $1000?? Try $1.94 – he set up the ad to be CPC with a $10 cost per click and within a few days I was dialoging with him and setting up a time to talk. Think of the possibilities here – a good friend of mine Mark Wilson from Sybase targets decision makers with what he called Provocative Marketing – this would make a perfect adjunct to that program where you could target a whole bunch of decision makers with personalized messages. Also think about the possibilities for Recruiting as well! This is the kind of innovative techniques marketers and agencies will need to be honing over the next few years. They took a sound marketing idea (targeting prospects) with a unique concept (1:1 Facebook Ads) combined with data (from my Facebook profile) and created a conversation that was hard to ignore. Now that’s the future of contextual advertising! This is the type of targeting that one-to-one marketing advocates have been looking forward to for a long time. It fits neatly within the one-to-one marketing concept of “treat different customers differently” — and it’s economical, too! We’ve had a lot of fun with this concept. Recently, we’ve also started to use this to market to our existing customer base, too. It’s a very low cost way to keep our brand in front of our customers. Think about that – keeping your brand in front of your customer base isn’t new. That’s just good marketing strategy… Using Facebook ads to place positive messaging in front of our customers specifically is just a new way of doing that. Creative application of good marketing strategy using the tools that make sense. That’s what we’re all about! What a crafty way to get someone’s attention. Great use of social media and targeting specific audiences. Good work! very cool use of social media! Very creative and insightful- the Grateful Dead attribute adds a nice touch! This just proves that there are endless possibilities using social media marketing. Impressive how someone can be targeted at such a low cost and with so little research. In a world where it’s difficult to get a first meeting amongst a sea of options, this is an effective tactic to get the message across. Also an innovative approach to using a social networking site for business. Can this technique be used in a way that assures the target that the ad is not an attempt by someone to spread a virus or spam your inbox like so many ads? Not at all surprising to see that Tim Kassouf is once again a leader with creative marketing strategies. He’s been on the cutting edge with great ideas for as long as I’ve known him! @Nora – I know I was surprised by the light amount of data as well! Sounds like very creative advertising by a very creative person. Sounds like it worked like a charm. I opened up my email today and I found an article from eMarketer that further supports this post. Thought you might enjoy it! 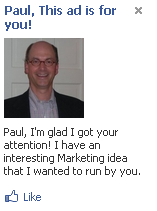 What an innovative way to us Facebook ads. This gives “Direct Marketing” a whole new meaning. Wow! how marketing has come so far in such a short amount of time! As a marketing/events/advertising professional, I am very excited to read about G. 1440/Tim Kassouf’s experiment with Paul. Its creative, its personal, and its direct..which is what every company & adverstiser wants. Gone are the days where social networking sites were blocked by companies because it was seen as a way to ‘waste time’ and goof off at work..now it IS the way to reach people. Very good article. I’m excited to hear more about this! Great idea Tim, so excited to be apart of the G.1440 fam! Pretty interesting stuff from G1440. It reminds me of Minority Report, where every ad from every advertiser was customized for the individual. I have a hard time resisting the urge to order a pizza when I see a Domino’s sign on the side of the road, so if this kind of thing gains steam I am pretty sure be penniless shortly after the personalized ads start hitting me. Seems like it could be a holy grail for B2B – pay only for quality, vetted leads that have actively expressed an interest in hearing from you. thank very much for this great blog;this is the kind of thing that maintain me come alive through out my day. I’ve been look around for this site after I hear about them from a buddy and was delight when I was able to find it after searching for some time. Being a avid blogger, I’m dazzled to see others taking initivative and contributing to the community. I just desire to remark to show my appreciation for your website as it’s very appleaing, and many writers do not get credit they deserve I am sure I’ll see again and will spread the formulate to my friends. There’s absolutely no doubt that this type of creative application has huge possibilities for web marketing. Kudos to the G.1440 team! This would be a great tactic for job seekers. Great way to reach out to potential employers!